A lovely woman (who I’m sure had no intention of breaking my heart) proclaimed at our farmers market booth just the other day. We’d just set up our stand which included hundreds of pounds worth of summer bounty and we were sweating head to toe from the 98 degree heat. I smiled, bit my tongue, and said nothing. The thing is, summer produce is at its peak in our neck of the woods and we’ve been waiting so damn long for fresh sweet corn, tomatoes, melons galore (even though the harvest is beyond back-breaking) peppers, cucumbers, zucchini (yes– even zucchini– the most hated vegetable during the month of August!). The winters are long around here and this moment in time is so short and treasured that I never want to rush it. Pumpkins can wait. Yep, they can wait until the last tomato of the season has been plucked from the vine and the summer squash has been tilled under. Don’t get me wrong, I love winter squash and hearty vegetables that nourish us through the dark days of winter–but those days aren’t here yet, and I’m holding onto every last taste of summer until I’m forced to indulge in our winter harvest. To honor this amazing time of year I leave you with my favorite “recipe” for cantaloupe. This obviously isn’t even a real recipe but that’s what is so wonderful about this time of the year. You don’t need a recipe to enjoy the fresh flavors of the season. A few spices, some good quality salt and voila!!! Your taste buds will be dancing!! Try your own spin and use whatever spices you have on hand–cayenne pepper or even smoked paprika could be nice! The most important thing is to use fresh, in season cantaloup and you really can’t mess this up! 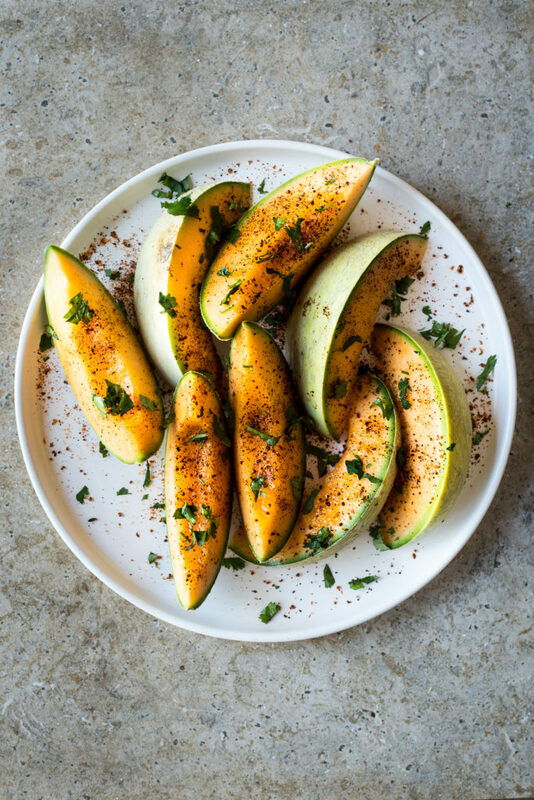 Sprinkle the sliced melon with the lime juice, chili powder, salt and cilantro. This sounds amazing! What a fresh take on flavors, thanks for sharing!